Masters of Ceremony brings together four artists across disciplines as equal partners in a shared endeavor: dancer/choreographers Rachel Bernsen and Melanie Maar, and musician/composers Taylor Ho Bynum and Abraham Gomez-Delgado. 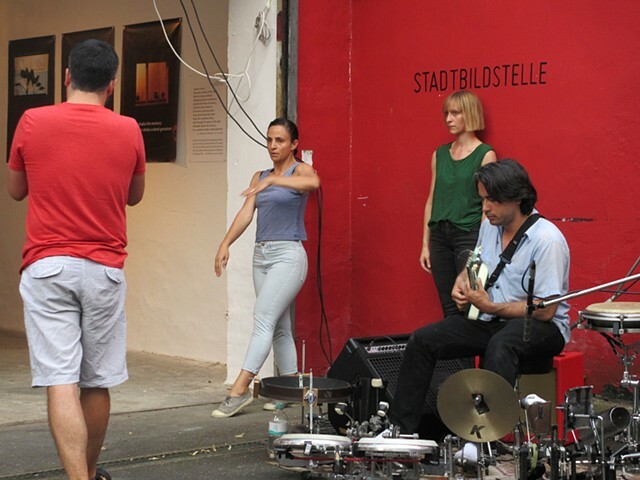 MoC got together to experiment with doing and undoing music and dance in performance. Performing together in various music and dance venues over the past four years, the group practices spontaneous action as a way to experience and share composition and choreography in the moment, continuously seeking a collective consciousness as well as individual presence. Scores, principles and structures are both developed and discarded, as the search for a trans-disciplinary understanding of risk and relationship, dialogue and intention, keeps this collective on its toes and ears. Since 2011, Master of Ceremony has been presented at The Moving Sounds Festival, The Vision Festival, The NOT Festival, The Poetry Project at St. Marks Church, Movement Research at Judson Church, as artists-in-residence at Jalopy, The BIG ROOM's Take Your Time Series, The Firehouse Space and internationally in Vienna, Austria, Kassel, Germany and in Amsterdam, The Netherlands. Masters of Ceremony were the keynote performers at Stonybrook University's Philosophy and Art Conference, 2013. Abraham Gomez-Delgado is a composer, multi-instrumentalist, vocalist and performance artist. He leads the avant-salsa band Zemog el Gallo Bueno and co-leads the trans-idiomatic big band Positive Catastrophe with Bynum, and is currently developing a multi-disciplinary performance work called Isla de la Mona, a fictional creation myth concerning his self-made instrument called the EJE. Melanie Maar is a New York based choreographer, dancer and teacher originally from Vienna, Austria. She was awarded the 2015 Grant to Artists from the Foundation for Contemporary Arts. Her work as a choreographer has been seen at Danspace Project, Chocolate Factory, Dance Theater Workshop, Roulette, Judson Church Movement Research, Baryshnikov Arts Center, as well as Impuls Tanz Vienna, Tanzfabrik Berlin und Alameda Museum Mexico City. Maar co-curated the Movement Research Festival 2011 and the Moving Sounds Festival for the Austrian Cultural Forum in 2013. She currently teaches for Movement Research and is on their artist advisory council. Other projects with musicians composers include Anthony Braxton and Kenta Nagai. As a performer Maar has worked with luciana achugar, RoseAnne Spradlin, Daria Fain, Luis Lara Malvacias and others. Rachel Bernsen is an independent dance artist, dance educator and certified teacher of the Alexander Technique. Her work has been shown regionally and internationally, from Dance Theater Workshop’s Fresh Tracks to Yale University’s World Performance Project to concerts in Belgium, Italy, Germany, and Holland. Rachel works regularly with the composer Anthony Braxton, choreographing and performing in his most recent opera Trillium J and his 8-hour, 70-performer Sonic Genome. She also performs in his interdisciplinary Pine Top Aerial Music project. She also has an ongoing collaboration with visual artist, Megan Craig. She is the founder of the performance space The BIG ROOM in New Haven and curator of its interdisciplinary performance series, Take Your Time. Rachel is a visiting assistant professor of dance at Trinity College. Cornetist and composer Taylor Ho Bynum leads his critically acclaimed Sextet and co-leads Positive Catastrophe with Gomez-Delgado in addition to numerous collaborative projects. He has performed with many of the leading figures in creative music, from legends like Anthony Braxton, Bill Dixon, Wadada Leo Smith, and Cecil Taylor, to forward-thinking peers like Tomas Fujiwara, Mary Halvorson, Jason Hwang, and Tyshawn Sorey.